The Gomernation is talking, and the Gomers are listening – and discussing. Join them as they confer about the Nation’s thoughts on podcasts and audiobooks, running in a straight line or in a circle, forward-thinking or being in the now, and dogs. 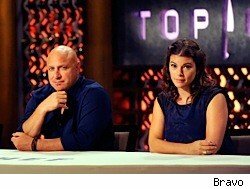 And even though no one in the nation mentioned Top Chef, it sure seems to come up a lot. I think we’re all in agreement that your Padma impression needs work. Be sure to join us next week, it’s a doozy! Happy running! I just finished listening to the minisode and of course I just had to clarify 🙂 I thought of you guys because I wanted you to know not to give up if you do fail. You two are awesome and inspire so many, I would hate to see you give up or be down on yourselves if you do fail (this does not mean at all that I think you will). I was totally insipred by what Jillian said, and I wanted that for you guys. It inspired me to make goals that you “think” you can’t do, and then “WOW” maybe you can do them. Goes with your “risk” theme. Mind games are fun to play when you are running. You mentioned using different techniques or ideas to power yourself through a hard run. It can be fun to invent different scenarios or short scripts that go with a score and pretend you are the main character. It can be anything you like to listen to, although I think that classical music or film scores work best. I like to cast myself as the hero or as an olympic athlete defending my villages honor against the evil galactic empire (or whatever). The idea is to have fun with it.